Built in 1902 in the Victorian Arts and Crafts style, the building was once a prominent building in a very civic setting in Waterloo Place. With its carriage porch and colonnaded façade, it was a very up–market hotel which held civic dances for the city’s elite. The building continued as a hotel up until the early sixties and more recently a restaurant and office accommodation above. 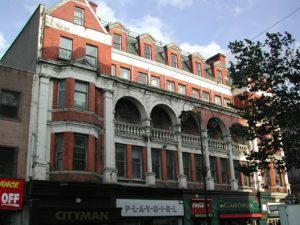 The Hotel was badly damaged by several bombs during The Troubles and much of the exterior ornamental detail and porte–cochre was lost. In 2002 at the beginning of the restoration project the building was rendered in a poor condition, suffering from water ingress, dry rot and infestation of pigeons. The existing facades were restored; the porte–cochre reinstated; and the main historic spaces restored such as the dining room. The old unlisted extensions behind where crumbling and subsequently demolished and a new three–storey glazed extension was built to accommodate disability access. 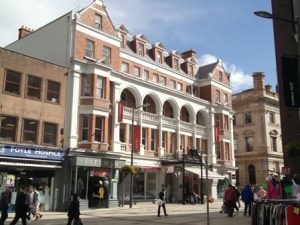 One of the most ambitious projects in the Walled City Partnership Townscape Heritage Initiative (THI) scheme, the hotel has now been restored to its former glory providing high quality retail and office space. 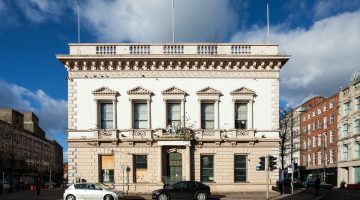 The finished project has restored the building to its former glory to accommodate 21st Century uses in the ever changing Maiden City. Restoration and reuse of the building has also secured its long term survival, preventing it from suffering the same fate as the previously demolished Tillie & Henderson factory. Heritage Lottery Townscape Heritage Initiative (THI) Scheme; Department of Social Development Derry; and NIEA Listed Building Grant Aid. *The Walled City Townscape Heritage Initiative (THI) is a grant aid programme for the restoration and regeneration of the historic built environment within a defined area in and around the historic city walls. The primary aim of the THI is to promote the sustainable and viable use of the buildings that make up the special architectural character of historic urban areas.